It was only a few years ago that I embraced the truth that I am an introvert. And I’m happy with that. I do enjoy the company of people, especially those I can connect with on a deep level. Sadly, I’m finding it more and more difficult to do that. I come away from most social gatherings, even small ones, wondering if I had wasted my time going. Conversations seem to be kept at a surface, we all seem to talk at each other and most of all there are always mobile phones to add noise and photographs to the gathering! I find myself drained after such social events. I’m grateful that I have José to come home to and really have a good conversation with. When is the last time that you had a great conversation, a conversation that wasn’t just two intersecting monologues, which is what passes for conversation a lot in this culture? I’ve had some of them recently … they are food and drink for the soul. A sense of awareness to realize who you are speaking to and what you are saying. It’s important to make your words count, but it’s also important to count your words. Succinct speech can be more effective than long winded talk. Being genuine and talking because you want to and not because it seems something you have to do. Trying to find common interests with the person you are talking to, so that both can participate actively. Asking leading questions that gets the other to talk about themselves or the subject. Listening with the intention to understand the other – even going beyond what they say, to understand what they feel. Empathy is highly under-rated. Checking with the other to see if you’ve understood her correctly. No attempts to impress or flatter. 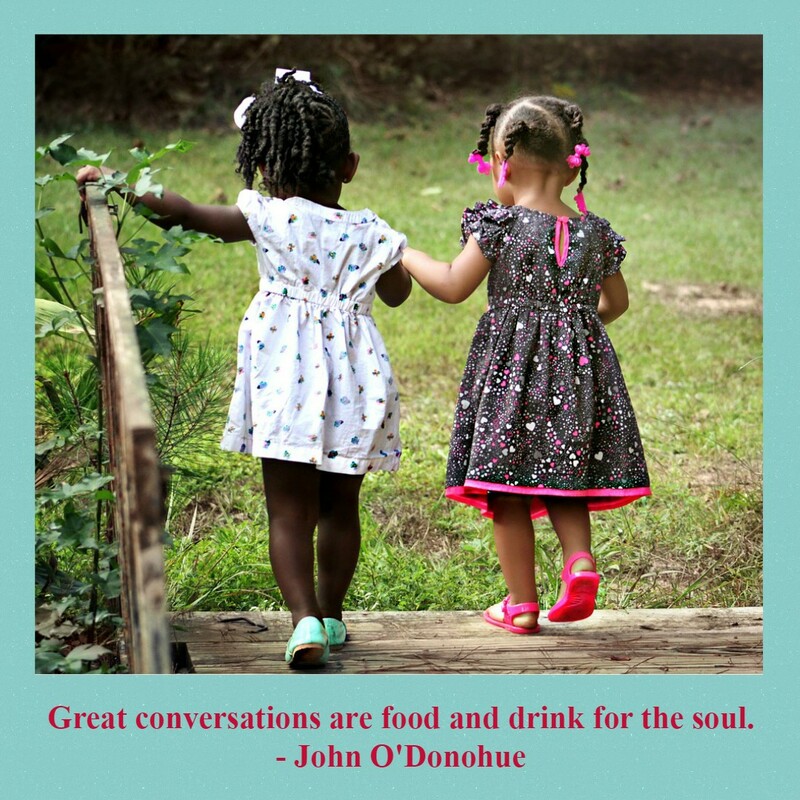 When was the last time you had a great conversation? Would you like to add something to my list? Today I’m happy to be co-hosting with Parul Thakur of Happiness and Food. Please read, comment on and share her post too. I always thought I was an extrovert because I’m so talkative, until the last year or two when I’ve been considering I’m more of an introvert and definitely need “recharging” time after going out. So funny that we can see ourselves so differently from reality at times. Corinne, this one is just resonating with me! I can go on and on about how we hardly have those heartfelt, genuine conversations even with good friends because everyone seems to be rushing around. At my age, I would rather have two or three good friends with whom I could have one of those honest, deep and genuine conversations that leaves me happy. Love the Donahue quote…it makes so much sense. Recently, Anamika and I met up…we had a wonderful, heart-to-heart conversation that day. Actually, even her son Dhruv had a heart-to-heart chat with me, believe it or not!!! We just connected like that. It was one of those moments when I felt I was meeting up with an old friend I had known for a long time. Sadly, time flew by and we had to take leave but with a promise to meet up again soon with our kids! Love the description by John O’Donohue. Like you Corinne I also find most groups draining and the conversations superficial. I am blessed that I have a few close friends with whom conversations are food and drink for the soul. Awesome post. Nice post. It’s very thought provoking. Socializing is difficult for me, and yet I find myself guilty of not listening to others so much as waiting for my chance to speak. I need to work on that. Be well! For my friends I am an extrovert, I can talk endlessly. But to a new person, I am The Introvert. I don’t know how to make small talks and start a conversation with a random person. Recently I met with my husband’s colleagues and wives. It was so bad. I couldn’t connect with any of the ladies. The conversations were not anything which could spark any interest in me. I wanted to write about the bitter experience but since they are real life people I refrained. But I felt so bad; they continued talking in Hindi even though they knew I don’t talk Hindi. And even the conversations which went on the lines of why it is important for everyone to have boy babies, was a big turn off for me. I concluded that I am better off without that group. I have 2 or 3 friends with whom I have sensible conversations. Husband and I also have such in-depth conversations on a daily basis. Hey superficial conversations are a put off for sure, making one wonder what really is the need to have such people and such chats around you. The last time I had a heartfelt conversation was when I met Esha in January. None of us wanted to take leave. Corinne, I was nodding all along reading this one. I am soo sick and tired of superficial conversations! But I live in a society where speaking your mind would only invite the wrath of people around, most of them being so shallow or narrow-minded. 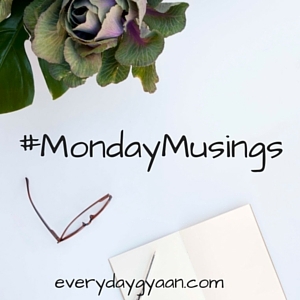 Honestly blogging is one world, where one is liberated enough to read and speak one’s mind in all honesty! Hubs and I try to have one once a day. He’s a great conversationalist. I too am still in the process of learning how to make true conversation. Whenever you come across someone that you are really connecting with–it’s a really good feeling. It really is like food and drink for the soul. Thank you for sharing! Yes, empathy is highly underrated! As an introvert, I seek quality conversation as well; it’s a misconception that introverts don’t need connection. We do, but we generally seek it in more depth in one-on-one situations. I think an important key, along with empathy, is remaining open in a space of non-judgement. When the two people both feel safe enough to say what ever is on their mind, without fear of being judged or misunderstood, the results can be priceless. That Donahue quote really got me thinking… and surprisingly, a few moments came to mind recently. And yes, i am grateful for them. They help you realize more about yourself – how you’ve come to accept truths and events. I feel in most social gatherings, conversations float only on a surface level. I believe I am very easy person to talk to, but my real conversations, like John O’Donohue describes, happen mostly with my husband and sister. Completely agree on all the points you have mentioned, most important of those being listening with the intention of understanding. The conversations you refer to I usually can have only with my nearest and dearest, and she died last month. I look around and can’t see anyone I feel comfortable with sharing my closest thoughts. But as an introvert as well (although I look extroverted) I prefer 1/1 to groups. I wonder how you could be an introvert. I love to talk and get connected with people all times. Great post and useful tips to have good conservation. I am an introvert as well. I would think so and why I think that? Well, I am very comfortable in most of the settings but the real me wants to keep things within and conversations – I love having them with close ones. I also can’t ever say what I would want. My choice takes a back seat with most of the people. The good thing is my great conversations are almost everyday 🙂 Your post made me reflect Corinne. True conversation is ‘an art’…quite difficult to learn. I am still in the process of learning it and meeting such people who can take a meaningful conversation forward in the right direction.